So it should come as no surprise that the puzzle above – a map of the New York City subway – is so awesome! I bought it when Marco and I were in New York City earlier this summer – purchased at the New York Transit Museum store at Grand Central station. 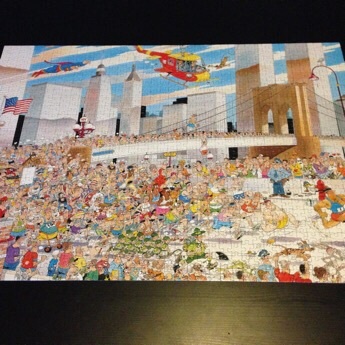 It is made by New York Puzzle Company. 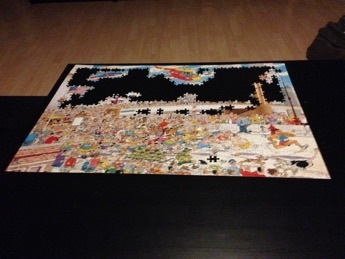 Unfortunately it is only 500 pieces (I am more a fan of 1,000 pieces), however admittedly it does fit on the coffee table better… but due to its smaller size it took only 2-3 nights to complete. I can’t say that I won’t be lost anymore in the subway, but at least it is fun to see how everything connects together! Who knew that part of the subway runs under Central Park? A close up of the butterfly. Do you see what the roses are made of? Wrapped chocolate and the best paper you could make flowers out of — 5 euro notes! It’s a relaxing night here over in The Hague. Marco is currently playing Assassin’s Creed: Black Flag (a free game offered recently on Xbox One) and I am writing this blog post. While preparing for this blog post I came across another post I had done only the second day after moving to the Netherlands: Second day (Or: Settling in and unpacking). It was interesting to re-read all of the little things we did that day to get me settled in. One of the benefits of keeping a blog I guess! Here is a random photo I took in the So Low in the centrum of The Hague. Sometimes you see the randomst things from American culture make it over to Europe (due to being used in films or TV shows mainly). 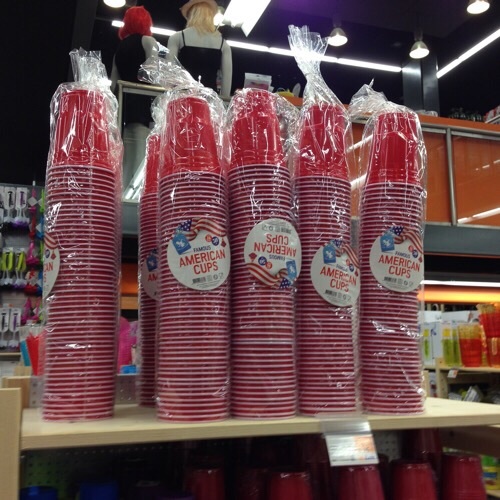 These cups are world famous for alcohol consumption at frat (fraternity) parties. Just to make sure the customer knows the connection, they are called “American cups”. My favorite, though? When you see something marketed as American or with an American flag which is most decidedly not American. I do not have any examples at the moment unfortunately. 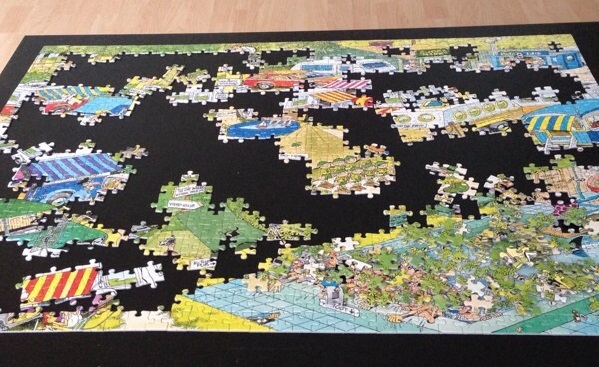 And that puzzle that I blogged about a few days ago? Done! The next one I have to put together has a car garage theme. Body paint to be exact. 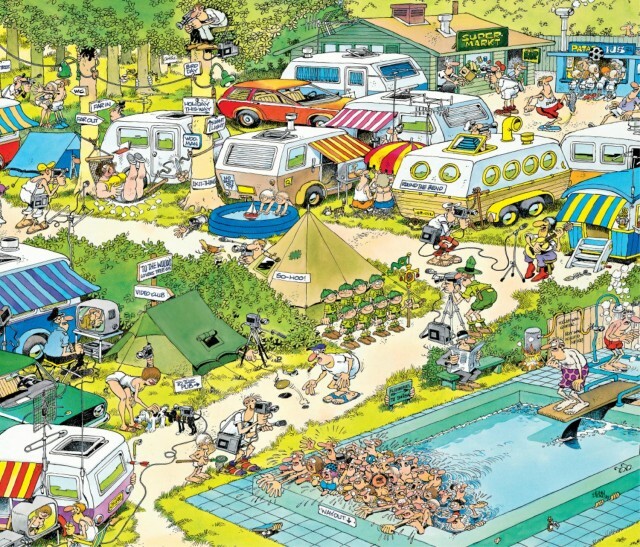 In the lower right you have a panicked mass of people trying to escape the man on the diving board. Well, actually, trying to escape the shark underneath the man on the diving board… There’s also a lot of people with cameras in this puzzle, occasionally filming scantily dressed women. That’s the Dutch humor for you. And of course the usual random floating hand coming out of unexpected places, a trademark of his. 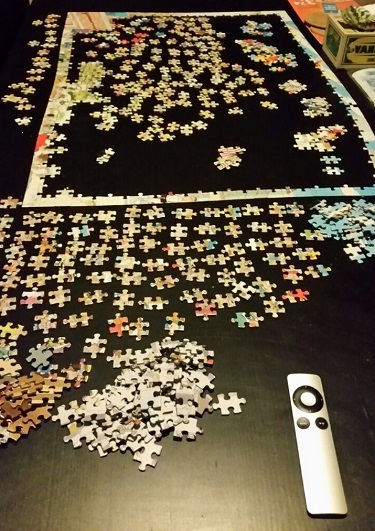 No Sinterklaas in this puzzle, though. You can find the puzzle here. 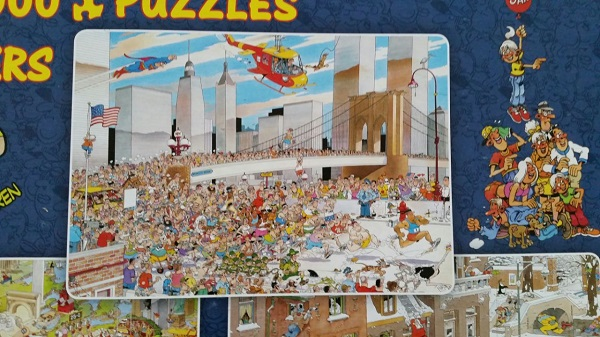 It is a Jan van Haasteren puzzle with the title NY Marathon – he is a well-known Dutch cartoonist. Part of the reason I like his puzzles is the fact that they are animated – it reminds me of a puzzle I had when I was younger (probably 500 pieces) with a mini golf theme. 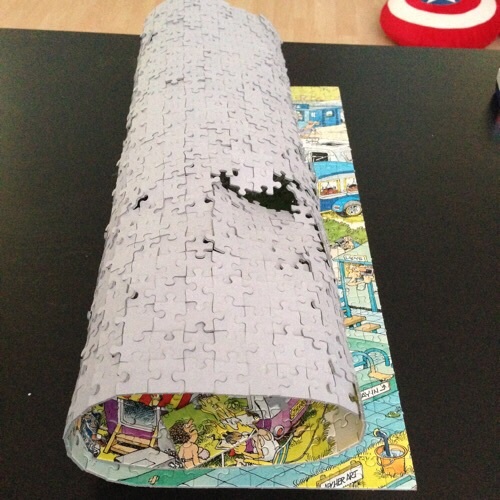 I had a small scare at one point when I couldn’t find one of the edge pieces (remember, it’s not my puzzle!) but after a while it turned up. 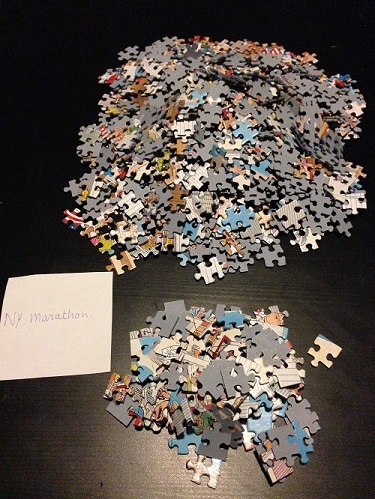 The biggest issue is the lack of table space – hence why I don’t have any puzzles of my own and it is better to borrow one from someone else. But still a long, long way to go. Back in late October 2009, when I had only lived in this current apartment for a few months, Marco had to buy a birthday gift for a friend’s young child. While searching for a gift in a store, he came across blank puzzle pieces. On a whim, he purchased four jigsaws and drew some images and phrases on each. He then had the bright idea to mail them to me a few at a time! So it was a while before I could complete the puzzles, though not forever. “ik ben van jou” -> I am yours. Funny story about the phrase above – he taught me two phrases back before I really started studying Dutch at all. 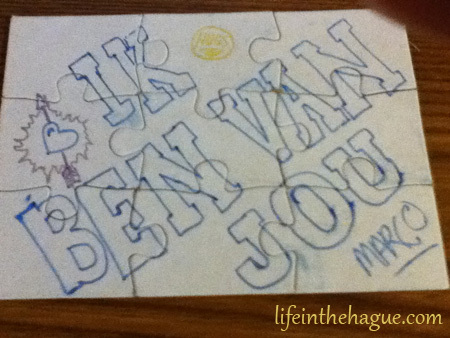 “ik ben van jou” – I am yours – and “jij bent van mij” – you are mine. As I had zero grounding in Dutch, he was teaching me to remember it based on memorization, so he said “jij BENT van mij”, while making a bending motion with his hands. So for whatever reason, that phrase reminded me of driving a car, with your hands on the steering wheel. So for a long time I could only differentiate between the two (ben vs. bent) by thinking of which one was where you were driving. 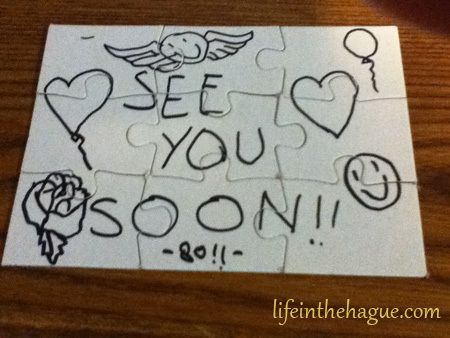 And this second jigsaw puzzle is proof that we have always been counting down days until we see each other again. At the bottom you can see the “80! !’ for 80 days. That would have been the Christmas trip where they visited my new digs for the first time. By the way – it is 28 days and about 20 hours until we see each other again.